The Wonder Twins have been a long-time superhero joke since their initial appearance in The All-New Super Friends Hour, functioning as goofy teenage sidekicks to the titular superhero team. They eventually made their way into comics, but they’ve never had their own series until now, with writer Mark Russell, artist Stephen Byrne, and letterer Dave Sharpe bringing them into the main DC Universe with a humor-driven series debuting as part of Brian Michael Bendis’ new Wonder Comics imprint. Russell has considerable experience rejuvenating cartoon concepts on the page with The Flintstones and Exit Stage Left: The Snagglepuss Chronicles, and he uses Zan, Jayna, and their pet monkey, Gleek, to delve into the anxieties of adolescence while also offering socio-political commentary on current events. Jayna has a strong activist streak, and her alien perspective allows her to question accepted practices on Earth and wonder if there isn’t a better way humans can solve the world’s myriad problems. This exclusive preview of this week’s Wonder Twins #3 puts the focus on Jayna as she makes a new friend at school and has a conversation with Superman while interning at the Hall of Justice. As Jayna laments superheroes’ inability to make last positive change for the planet, Superman tells her that the most important power on Earth is “seeing everything wrong with this world...and somehow not going crazy.” This book deals with some heavy material, but Byrne’s artwork maintains a light, cartoony tone that prevents the series from wallowing in the darker aspects of the plot. 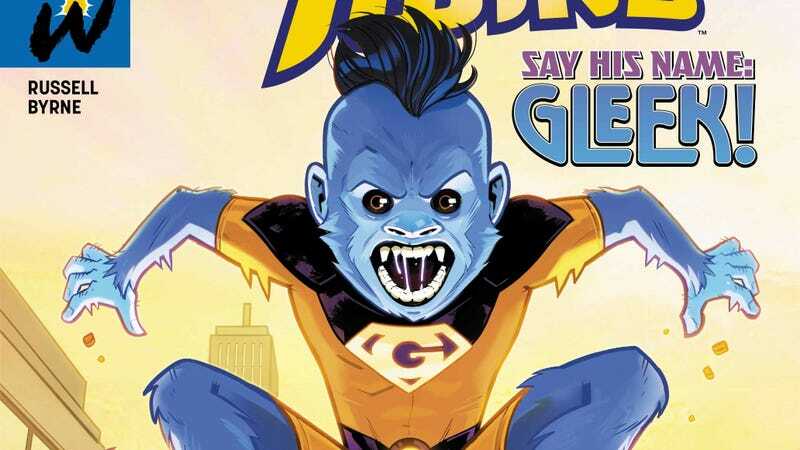 The cover is a hilarious example of this tonal contrast as it shows Gleek jumping toward the reader in a fury with the caption, “SAY HIS NAME: GLEEK!”, establishing the primal nature of the twins’ new simian pet. Byrne still brings gravitas to serious moments like Superman’s tragic comment, but there’s always humor to keep the characters connected to their upbeat roots.